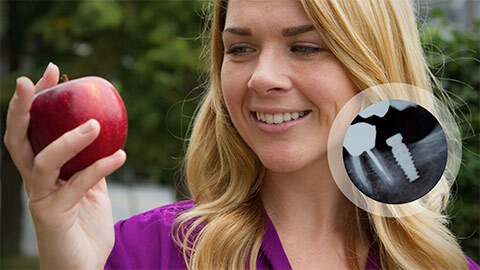 Clarkston and Waterford Dental Implants | David A. Wright D.D.S., P.C. Tooth loss is caused by a variety of problems and conditions, from gingivitis to tooth decay, excessive tobacco use to periodontal diseases and dental injury. Despite this grim reality, however, there is good news for patients who suffer from the debilitating and traumatic loss of their teeth: our Waterford Dental Implants can replace teeth, and restore them to full health and functionality. Dental implants improve the functionality and appearance of your teeth, and help contribute to a beautiful, pleasing smile. Dental implants are, by far, the most optimal and versatile solution for missing teeth: because they are fixed and durable, dental implants won’t disrupt your daily life. Dental implants are small titanium posts that Dr. Wright will install into the jawbone underneath the gums. They essentially act like artificial tooth roots that will be then used to support and secure individual replacement teeth, dental bridges or dentures. Ideal candidates for dental implants include patients who still have a sufficient amount of bone left intact below their gums, which would also have to be free of periodontitis. Prior to the installation of dental implants, each patient is carefully evaluated in order for Dr. Wright to determine what implant option would best suit their needs. 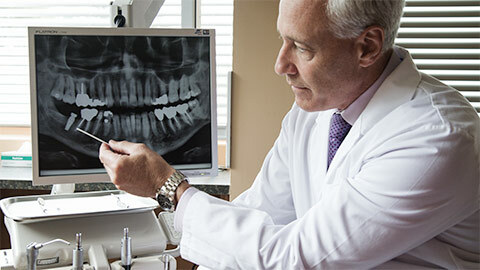 Following the initial steps, the implant is carefully placed in the bone socket of a missing tooth. During the healing process afterwards, the implant will fuse seamlessly into the jawbone. 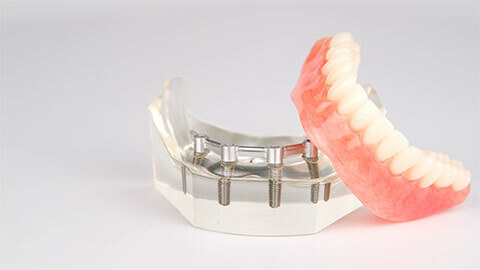 It is also during this time that Dr. Wright will create a set of artificial teeth, dentures or bridges based on molds of your gums and bite. As a result, once your implants have successfully fused into the bone, the artificial teeth will comfortably slip over the implants. You will be free to enjoy your favorite foods again, as well as speak and smile with greater eloquence and confidence. Mini implants are an option for patients who don’t have enough bone required for the safe installation of regular implants, though they work in the same fashion as regular implants. Unlike regular implants, however, your mini implants don’t need as lengthy of a healing period. In fact, they can be installed in just minutes. Patients who have mini implants installed can enjoy full functionality of their teeth in no time. Although dental implants may seem pricey, they are a smart, cost-effective choice in the long run. Because they are composed of strong titanium alloys, they require less follow-up dental appointments than dentures and dental bridges -- both of which may need continuous adjustments by Dr. Wright over time. Dental implants require minimal care as well. Because they look and feel and act just like your normal teeth, they can also be maintained by regular flossing and brushing. If you need more information about Dental Implants in Clarkston and Waterford, contact us today.